"A relationship guide masterpiece!" "So much more than the title implies." GET TWO FREE CHAPTERS HERE! "Incredible insights." "Genuinely life-changing." "For all of us who believe in the possibility of rediscovering our true sexual potential." "Reading it together is great foreplay!" Purchase a signed copy of the special edition hardcover of The Soulmate Lover—makes a beautiful gift! 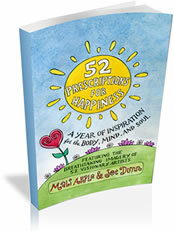 52 weeks of ideas for opening up your body, expanding your mind, and nurturing your soul! DOWNLOAD YOUR FREE SAMPLE HERE. We donate a portion of the proceeds from all sales to support humanitarian causes. Currently we are supporting women in developing countries in the form of microloans. With these loans, women can establish businesses to support themselves and their families.